For this week’s MagpieMonday post I have several pieces of glassware. I am always hoping to find beautiful glass items when I go on my trips around boot sales and charity shops but rarely find anything that really takes my breath away. When I saw the following pieces I was immediately in love and snapped them up. The beautiful vase in the centre of this photo is actually new (sorry, hope it still counts) I found it in one of my other regular haunts TK Maxx. It had a price tag of just £7 !! I couldn’t believe it, its the most gorgeous piece of glassware, beautifully made and really heavy. I love it and can’t wait to get some large white flowers to pop in it. The pretty glass bowl has a blue etched pattern on the front and back, I found two for 10p each in the charity shop. Possibly not very old, but really pretty. 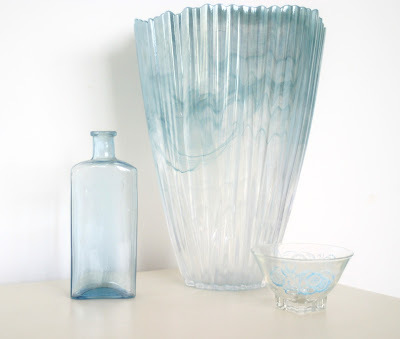 I have a few blue bottles like the one in this picture, I love them all in a line down the table with a single flower. Simple but elegant, I won this one off Ebay for 99p. I am not sure at all whether this is a vase? or an ice cream sundae cup ? I don’t think it is new as it is really heavy glass with a “old” frosted appearance. I really don’t mind either way as its the most beautiful colour and matches perfectly with the taper candles I decided to store in it. 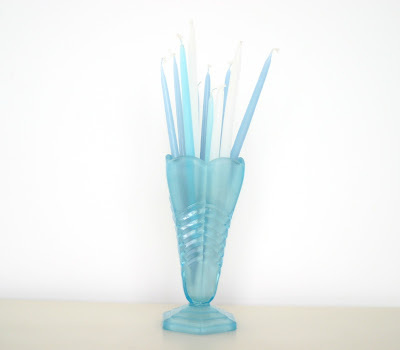 It cost 50p from the chairity shop and all the candles were just 10p for the lot! I was thrilled when I saw this bottle ! A bottle with a tap! ha! I love it. I knew straight away what I would use it for and it now sits on the side of the kitchen sink with washing up liquid in it ! (no dishwasher in this house) Not sure what its original use would be maybe Olive Oil ? It must be reasonable old looking at the tap and the thickness and quality of the glass but I could be wrong. Cost me £1 in charity shop. 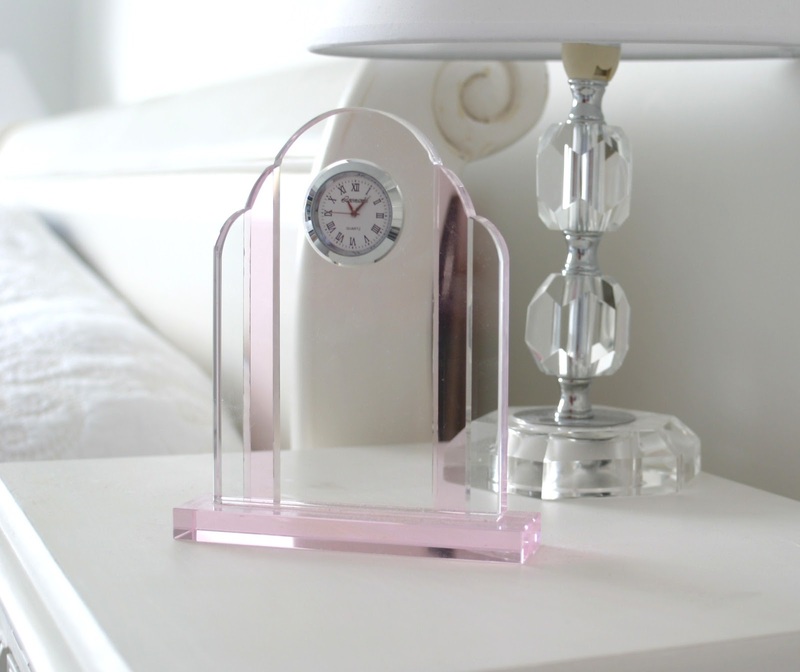 Finally this week, this totally stunning, too die for pink glass clock in the art deco style (but obviously a modern clock as it has a battery). It was locked in a cabinet in the charity shop – where they put the posh stuff ! I paid £3 and I love! love! love! it. It sits on my bedside table, so pretty and gives me joy everyday just to look at it. Don’t forget to pop over to Lizzie’s MagpieMonday to see all the other great thrifted finds this week. Next Post New York ! New York ! Very envious of the bottle with tap. I wonder if you added different coloured washing up liquid they would all bleed or stay separate? I don't have a dishwasher either, and hide the plastic bottle of liquid because it just looks tacky! Great finds, I'd love to do a tour of your house. All gorgeous as ever but the bottle with the tap is just fabulous! I love it! What stunning photographs. 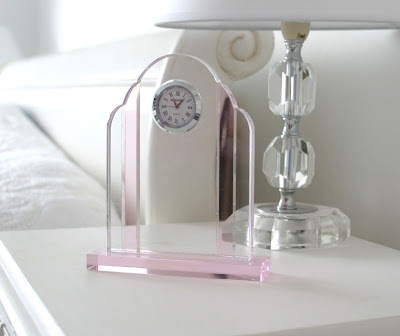 I absolutely love the little clock and the vase you bought from TK Max. 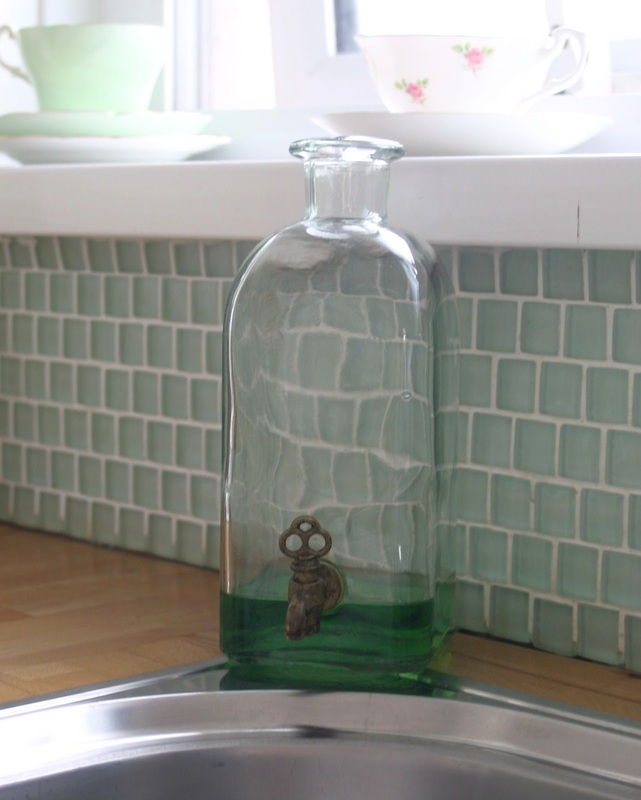 Some fabulous finds, there – and gorgeous pictures as well – that tap bottle is brilliant! Glass is so pretty. I have been looking out in the charity shops, haven't found anything to take my fancy so far 🙁 will persevere though! Oh wow!! Love love love the bottle with tap!! Fabulous!